Solute yields, laboratory dissolution data and both chemical and isotopic markers of rock weathering reactions are used to characterise the biogeochemistry of glacial meltwaters draining a maritime Antarctic glacier. We find that delayed flowpaths through ice-marginal talus and moraine sediments are critical for the acquisition of solute from rock minerals because delayed flowpaths through subglacial sediments are absent beneath this small, cold-based glacier. Here the mechanisms of weathering are similar to those reported in subglacial environments, and include sub-oxic conditions in the early summer and increasingly oxic conditions thereafter. 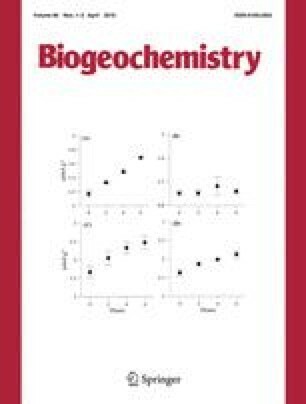 Up to 85% of the NO3 − and 65% of the SO4 2− are most likely produced by bacterially mediated reactions in these ice marginal sediments. However, reactive pyrite phases are sparse in the host rocks, limiting the export of Fe, SO4 2− and cations that may be removed by weathering once pyrite oxidation has taken place. This means that dissolution of Ca2+ and Na+ from carbonate and silicate minerals dominate, producing moderate cationic denudation yields from Tuva Glacier (163 Σ*meq+ m−2 a−1) compared to a global range of values (94–4,200 Σ*meq+ km−2 a−1). Overall, crustally derived cations represent 42% of the total cationic flux, the rest being accounted for by snowpack sources. Hodson acknowledges a NERC AFI (CGS4/08) award and a National Geographic Exploration and Research Committee award for supporting his field work. Judith Brown, Simon Herniman and Bill Crowe are thanked for help with the field and lab work, whilst NERC BGS Steering Committee award (IP/776/0503) is acknowledged for the isotope support. A Leverhulme Research Fellowship is acknowledged for allowing time for Hodson to complete the manuscript, which was then improved by two anonymous reviewers.